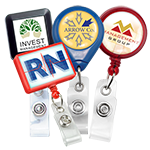 The square-shaped imprint space allows more text and bigger logos to be displayed compared to round badge reels. 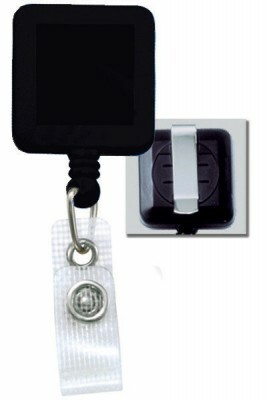 This black, square badge reel features a reinforced vinyl strap to effectively secure your identification credentials. 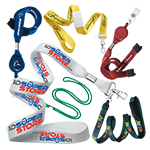 A belt clip is also included to allow attaching it to belt loops and luggage straps. 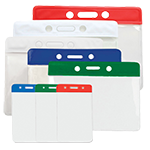 The square badge reel's retractable cord's length extends up to 34", sufficiently allowing access cards to be swiped or scanned within arm's length. I don't like the strap. 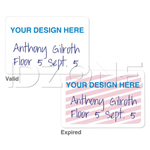 I recommend this badge reel to anyone looking for an ID accessory. 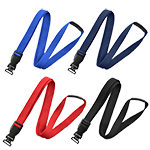 The reinforced vinyl strap and belt clip holds up well. 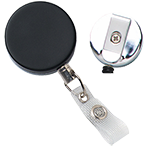 This is a durable badge reel. Our maintenance guys love this.